Icebreaker is an outdoor clothing brand with a twist: they only sell merino wool garments. From a solo entrepreneur to an international brand selling in stores across 30 countries, Icebreaker was ready to enable ecommerce beyond its US only website. 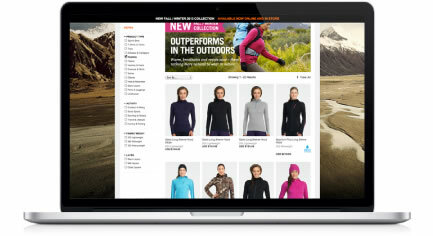 Icebreaker wanted to retain their growing leadership in the merino outdoor clothing market and they wanted online users to have the best experience possible. Icebreaker sought guidance from Experience Dynamics. One of the first things we realized after working closely with the Icebreaker ecommerce team was that merino wool had an entirely different purchase decision process than synthetic or even regular wool. Our field studies revealed the same. Supporting purchase decision making for ecommerce shoppers while communicate a strong brand and value proposition would require specific features and tools to support users. Icebreaker’s itch and odor free product needed to connect with the activities and values of its users. Icebreaker current and prospective customers both needed 'merino education'. Learning how to layer, how to use merino wool and how to buy Icebreaker were critical to ecommerce conversions. Our ethnographic field study visits lead us into analyzing the wardrobes of target customers. We gained deep insight into perceptions of merino wool, Icebreaker and their purchase motivations. These insights went directly into crafting conversion-oriented copy and website layouts. Since Icebreaker wanted to roll out to an international audience beyond North America, we interviewed fitness enthusiasts in France and Germany, Switzerland and the UK to learn about their shopping preferences. 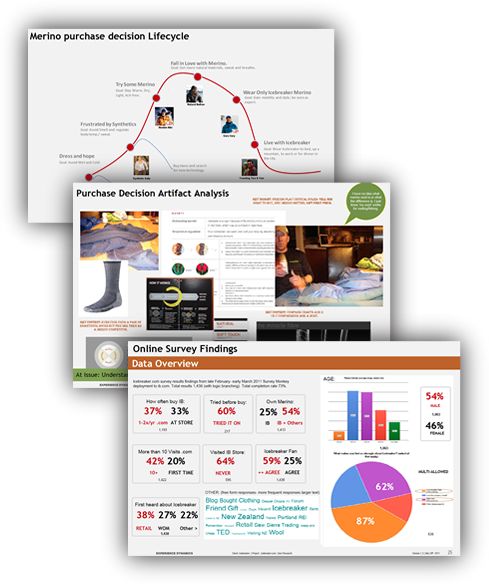 This helped round out our purchase decision analysis and discover critical factors in helping customers convert on the site. After extensive rapid design prototyping, wireframes were tested with users to flush out weak conversion areas--prior to development. An impending launch date meant risks in changing the ecommerce platform templates needed to be mitigated. With close collaboration, a deep understanding of user needs, Experience Dynamics provided fast answers and UX direction to the branding agency and the development partners during the creative and implementation phases for an on-schedule and itch-free launch. Several years after launch, Icebreaker.com is now enjoying a 300% increase in revenue, in large part due to website sales. The site user experience now reaches customers in 17 countries. A major success for a global roll-out.